The Yarra Pools concept was announced back in 2016. The concept in its essence is to open up the Yarra River to be more accessible by locals, and visitors to Melbourne. “If we want people to want to protect the Yarra we need people to engage with the river. What I like about this project is the wetlands, the soft connection with our waterway. We have too many walls along our river and this concept is starting to break them down, and that’s fantastic. It turns an under-loved part of the river into a magnet for people (and wildlife) and celebrates our connection with water.” Said Yarra Riverkeeper Andrew Kelly. The team behind the Yarra Pools project has teamed up with local studio WOWOWA Architects to create a new render of the concept and bring it to life visually. 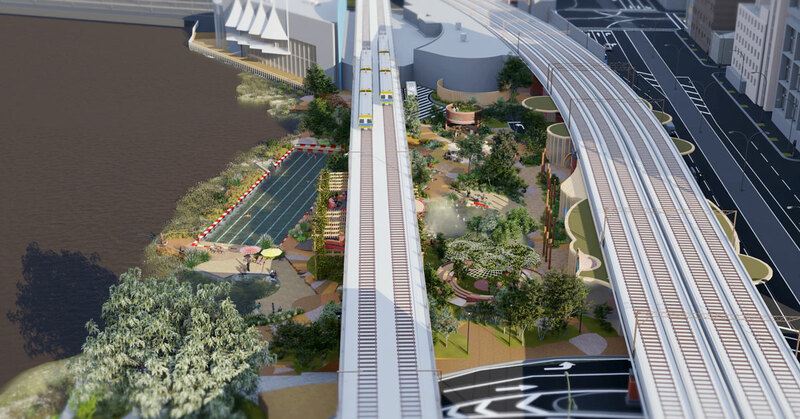 The Yarra Pool precinct will incorporate a 50m lap pool, wetlands, a café, changing facilities, community pavilions, and a kayak launching spot. All up, it will definitely transform the under-utilised area next to Melbourne Aquarium. “This new design render is the culmination of two years of deep research into what Melburnians want the Yarra Pool to be. It’s based on our core design principles that were shaped by extensive community engagement, existing government strategies and regulation, and economic considerations for the City of Melbourne.” Michel O’Neill of Yarra Pools. This current design is the culmination of more than two years worth of public engagement, with the space being required to be usable all year round, have a positive environmental impact, and accommodate a variety of uses, along with celebrating the unique cultural values of the particular site. It is anticipated that the concept would attract 350,000 people per year to swim, with that number expected to grow to 550,000 by 2036. Looking for something to do in Melbourne right now? Check out our Things To Do section.